Are you looking for a multi-functional stroller that you could use on different occasions? Then a standard convertible stroller may be perfect for you. 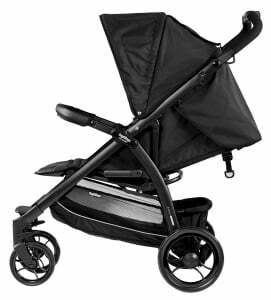 Modern standard strollers are designed for everyday use, mostly in the city, but some of them are also suitable for all types of terrain. This category of strollers is a great option for parents who don’t need a specialized model, but would rather prefer all-in-one stroller. Nowadays standard stroller are convertible – practically all modern strollers are compatible with different infant car seats and can be converted into a travel systems. Some models can even expand to a double stroller and adjust to growing family. In this article I present you the best standard convertible strollers that you can find on the market in 2019. There are dozens of standard, convertible strollers on the market right now. Here I present you only the most reliable modern stroller, highly rated by customers. Each of them can be converted into a travel system and some models even expand into a double stroller. These convertible strollers have different features, but they have few things in common: they are made of quality materials, they are convenient to use for parents and provide safe ride for the baby. This is one of the most popular convertible strollers – in can be used from birth with an infant car seat, it is perfect for everyday use and can handle pretty much any type of terrain. And the best part is that this convertible stroller doesn’t cost a fortune – it’s a medium price range model. The regular seat is suitable for baby who has neck and head control, but you can use this stroller also for newborn, if you add an infant car seat. Baby Jogger City Mini GT can be converted into a travel system with City GO infant car seat. It is also compatible with many different car seat brands llike Britax, Chicco, Graco, Peg Perego and more. Keep in mind that car seat adapters are sold separately (check for example Maxi-Cosi and Cybex adapter). You can also convert City Mini GT into a pram by adding a bassinet (also sold separately). Back to the regular seat – it can hold a passenger up to 65 lbs. It features multi-position recline and goes really low so it’s perfect for naps on the go. When the seat is fully reclined you can use the vented top which provides nice extra air-flow or you can close it with a weather cover on chilly days. I love the canopy – it goes really far down and covers baby’s face and torso. Moreover, there are two peek-a-boo windows, one on each panel. 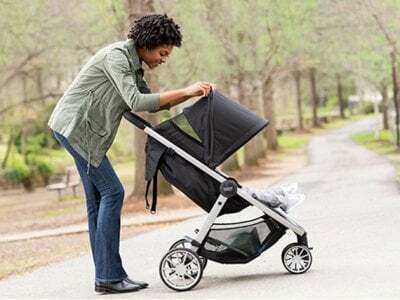 So no matter if you use fully extended canopy or if it’s just half open, you can always check on your baby during the stroll. I only wish the closure was magnetic, not this noisy Velcro. Another great thing about this convertible stroller is the adjustable handlebar which rotates up and down to accommodate shorter and higher parents. If there’s a height difference between you to, like between me and my husband, this handlebar will be super useful. I also like the rubberized rings on the grip which make the handlebar very comfortable and durable. 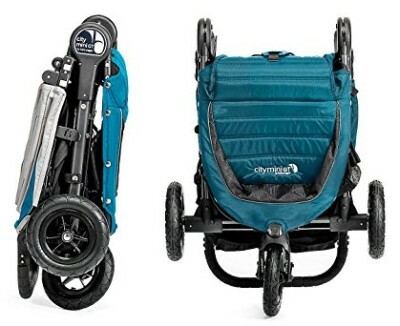 Baby Jogger City Mini GT has 8.5’’ non-inflatable rubber wheels and front wheel suspension which makes this standard stroller suitable for all types of terrain. It has also 3-wheel design which makes it very maneuverable and nimble, almost like a jogging stroller. But keep in mind that although this stroller is agile and handles even rough ground, it is not designed for jogging. This model doesn’t have foot-operated brake, but hand-operated parking brake. However, it doesn’t look like a bicycle handbrake, instead there is a toggle on the back of the canopy, just below the handlebar. It’s nice to have the control within reach. There’s one more awesome feature that I love about this stroller – one-hand quick fold. Thanks to patented technology City Mini GT is a breeze to fold. The stroller pretty much folds itself. There’s also an auto-lock that keeps it closed which makes storage and transport more easy. I also like how flat this stroller is after folding – it won’t take much space in your car or home (folded dimensions: 29.53″ x 24.21″ x 10.24″) . And since the stroller weighs 22.5 lbs you shouldn’t have any problems with lifting it to the trunk or carrying down the stairs. Now let’s talk about the storage space. The basket under the seat is decent, but definitely not the biggest on the market. It can hold a medium-sized diaper back. I wish it was slightly bigger to accommodate more stuff, especially when you’re going on a day trip. Good thing is that there a mesh pocket on the back of the seat where parents can keep their essentials at hand – you can fit there your wallet, phone, keys and even a bottle of water. Want to learn more about City Mini GT features? Check out my full review. 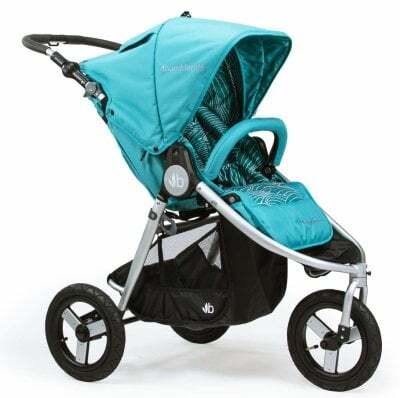 As I said earlier this is very popular model, one of the best-selling convertible strollers. I checked it at Amazon to find out what other parents say about it and check if it’s worth the money. It has a lot of reviews and most of them are positive ones. If you would like to read some of the customers reviews you can just click here to skip to Amazon. Below you can see the most often mentioned assets and drawbacks. 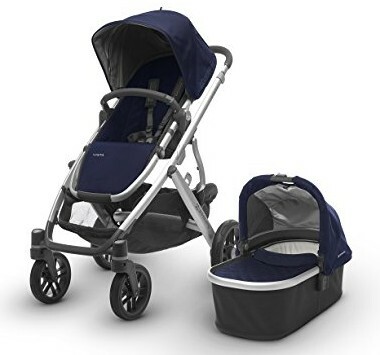 This stroller is available in few color versions and last time I checked it at Amazon all colors had different prices (some were much cheaper). Make sure to compare prices and discounts of all versions, before you decide to buy this stroller. You can do it here. Also, remember that accessories like parent console, child tray or weather shield are sold separately. 1. This stroller is a space-saver. It features compact and flat fold so you don’t have to worry about storage or transport. It’s perfect for parents who have small apartment or small car. 2. According to many parents this stroller is perfect combination of ergonomics, comfort, quality and reasonable price. 3. This convertible stroller is a long-term investment and serves for older toddlers – many parent use it for 3 and 4-year-old kids. Now it’s time for the best convertible stroller in terms of agility and suitability for all types of terrain. Bumbleride Indie can be the only stroller you will ever need: it works great for running every day errands as well as going off road. It’s a truly all-in-one stroller. Another thing that you’re going to love about Indie is that it converts from infant to toddler stroller. The seat reclines to flat position that is super comfy for toddlers who still like to nap during strolls. Rich, cushioned padding also makes the difference here. If you recline the backrest all the way down and flip up the calf rest you’ll have an infant mode – cozy and sheltered place for small infants. By the way, I love Indie’s fully adjustable leg rest, it’s not a very common feature actually! There are two additional options for parents who want to use this stroller from birth: bassinet or infant car seat (sold separately). Bumbleride Indie is compatible with Graco, Chicco, Maxi Cosi, Cybex, Nuna and Peg Perego car seats. The adapter is of course an additional cost, but the good thing is that you either remove the seat fabric before attaching the car seat or install it onto the seat – whatever is more convenient for you. There is one thing that I need to emphasize. The main seat is facing forward and you cannot reverse it. That’s why I prefer using bassinet for longer distances with infants under 6 months as I prefer to see them. It’s just my opinion, but you should also keep that in mind. *If you’re opting for a medium-price stroller with reversible seat check Cybex Balios S.
You will also love the vented seat top that will provide excellent air flow on hot summer days. Speaking of summer – you don’t have to worry about sun disturbing your little one’s nap! Big, extendable canopy with additional sun visor will shade your baby and keep the sun out of their eyes. Of course you can peek on your child the whole time – through the vented seat top or peek-a-boo window on the canopy. PRO TIP: If you plan on getting this stroller, choose the newest model. Bumbleride Indie 2018/2019 has improved canopy that offers more head room and doesn’t get in the way as the child grows. Other useful features are: included bumper bar and very spacious storage basket under the seat – it’s sufficient even for a large diaper bag. For small essentials like a cell phone or wallet there are two pouches and one zippered pocket on the seat back. For baby’s sippy cup or snacks there is a pocket inside the seat – very handy. This modern stroller has also adjustable handlebar that rotates from 26.5″ to 45.5″. With such a wide range of settings Indie is convenient to push for very tall, as well as very short parents (or even older siblings). As I mention at the beginning, Bumbleride Indie is suitable for all types of terrain – all thanks to 12″ wheels with pumped tires and all-wheel suspension. Of course inflatable tires require more maintenance and frequent pumping, but the smooth ride is worth it! Besides, the tire pump is included! This single convertible stroller pushes and navigates like a breeze (with one hand!) and can handle even the rough surfaces. The suspension cushions the ride and protects little passenger from getting bumped around. 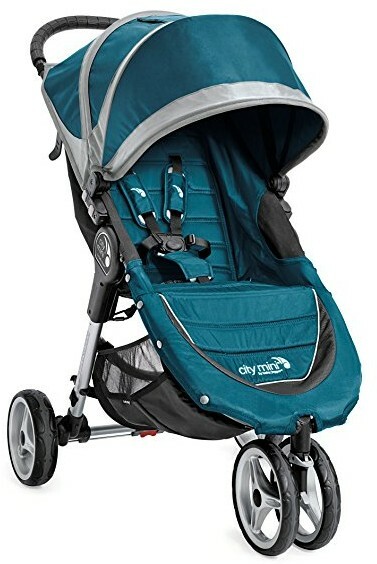 It’s really amazing, because this stroller rides as smoothly as some of the jogging strollers, but it’s less bulky and definitely not excessively heavy (only 24 lbs). 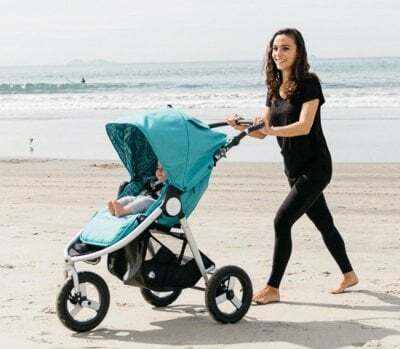 Thanks to that you can use it as everyday stroller – for going to parks, to the daycare, shopping in small grocery stores, as well as for trips to Disneyland or adventures in woods and on dirt roads. 3-wheel design makes this convertible stroller very nimble and you can turn it with one hand effortlessly. Front wheel also locks for greater stability on bumpy terrain. You’ll also love how easily this multi-functional stroller folds. The seat folds inwards therefore it’s not exposed to dirt or dust (big plus! ), it locks automatically and stands on its own. Fold maybe not ultra-compact, but it’s also not cumbersome (32″L x 24.5″W x 11.5″H). I’ve seen lots of convertible strollers bigger than that! Indie single stroller should fit in most medium sized car trunks with ease. All-terrain stroller with ample storage space and comfy deep recline is your dream? Look no further, Bumbleride Indie checks all the boxes. And if the stroller look is also important to you – Indie won’t disappoint you. It comes in 6 different color versions and all of them look trendy and cute. My favorite Tourmaline Wave model has also a beautiful pattern on the interior padding. 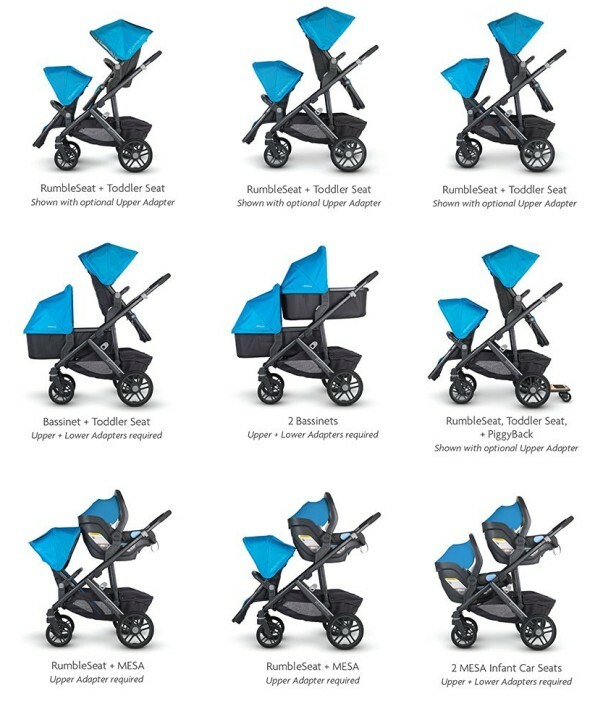 Bumbleride Indie price is rather on the higher end therefore it’s not a super popular stroller. It doesn’t have many reviews at Amazon, but you can read more comments on brand’s official website. I went through all of these customer reviews and here’s my summary. If you’re advanced runner and you love long distances on harsh terrain, you should go for Bumbleride Speed which is more heavy-duty jogger. Indie is great for everyday use + light jogging. 1. It’s a perfect stroller for summer. It has large vented canopy that extends far to fully shade the baby. You won’t have to worry about sun burns or overheating. 2. The possibility of having infant mode is awesome. Not all parents can afford (or want to have) a bassinet. It’s also less equipment to store! 3. You won’t need another stroller, because you can use this one anywhere. From strolls in park to shopping mall to beach to light jogging on dirt roads. Let’s be honest, this stroller is pricey. Before you buy it, make sure to check if there are any discounts (at Amazon or at PishPosh Baby)! There is one model that stands out from other strollers in Cybex lineup – Balios S. What distinguishes this stroller? Its versatile features, suitability for multiple types of terrain, simple but beautiful design and more affordable price! If you have already done some research on baby strollers, you’ve probably heard about brand named Cybex. Maybe you even know that this brand is well-known for designing high-quality and fashionable strollers which are quite expensive. And Balios S is exactly like that, but doesn’t cost a fortune like Cybex Priam or Cybex Mios. With Balios S you can have Cybex stylish design and top notch quality, but at much lower price. Sounds nice? Keep reading to find more details about this stroller. As one of the best convertible strollers for 2019, Cybex Balios S can be used with different seating options. The basic set includes the regular seat that is suitable from birth up to about 4 years. This seat reclines with one hand all the way down – seriously it’s one of the deepest recline ever – and according to the manufacturer it’s newborn-ready. I would still recommend adding a newborn cocoon to keep a small baby securely in place and support their head and back better. This fantastic convertible stroller allow you to attach an infant car seat onto the frame. However it’s only compatible with Cybex and GB car seats and you still need adapters to connect the stroller and car seat. Therefore first you need to remove the seat unit as the car seat doesn’t attach to the seat, but only to the frame and then you need to click-in the adapters. Some customers say it’s a bit inconvenient – because it’s an extra activity that you need to do before you place the car seat onto the frame. And you need to pay extra for these adapters. You can also replace the main seat with a bassinet (sold separately here). This is a better solution than a travel system if you plan on going for longer strolls with your newborn baby. Bassinet is more comfy and supportive for long periods than the car seat. Despite some small drawbacks, all of these seating combinations make this stroller all-purpose and usable for couple of years. I’m happy that this stroller converts from a travel system to infant stroller to toddler stroller within few second. When I saw Cybex Balios S for the first time I was charmed by the main seat functionality. It’s not only fully reclinable, but also has adjustable calf rest and it’s quite high up on the frame therefore you can wheel the stroller up to the table! Moreover, little passengers can ride facing parents or the World, depending on their age and mood. If you are looking for a stroller with reversible seat or a convertible “infant-to-toddler” stroller Cybex Balios S will definitely fill your needs. Moving forward, there is also enormous canopy that offers complete cover from the sun. Thanks to zip open mesh panel it provides really great air circulation. Another feature, that short moms like me and tall dads like my hubby will like is the adjustable handlebar. It’s not a rotating bar – it slides up and down. 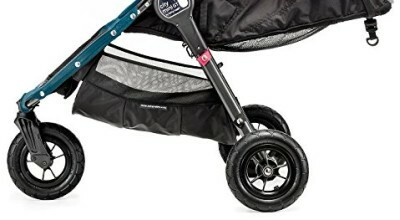 It’s a very convenient solution because it gives more space behind the stroller for parents with long legs so they don’t kick the rear wheels or basket while pushing the stroller! The basket underneath the seat is fairly spacious. Of course it could have been more capacious, especially since Balios S is quite a big stroller. But I don’t complain about it, it did fit my large backpack diaper bag so that’s sufficient for me. Unfortunately there are no additional pockets for storing small items like phone or wallet. Parent organizer, as well as child snack tray are sold separately. The last thing that I want to mention here is the folding mechanism. Some parents say it’s a piece of cake while others complain it’s difficult and annoying. First of all, folding is two-step process. Secondly, it takes practice to get used to this mechanism. But I think if you practice it few time at home before going for your outdoors adventure, you will master it and it will take up few seconds to fold up the stroller. On a positive note, Cybex Balios S is not excessively heavy – it weighs about 24.7 lbs – therefore it’s not that difficult to put it in the car trunk. Besides, it has quite a compact fold, smaller than UPPAbaby VISTA, Britax B-Free and Baby Jogger City Select and only slightly higher than Britax B-Agile! To learn more about this convertible stroller read my in-depth review. 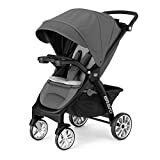 I checked what other customers wrote about this stroller at Amazon to find out that many of them describes it as reliable and worth buying. 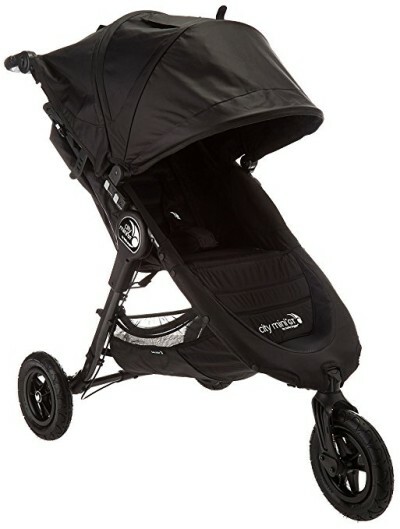 Customers praise this convertible stroller for its multi-functionality and chic look. You can check the most often mentioned features in the table below or skip to Amazon and read the customer reviews on your own. Cybex Balios S is compatible only with Cybex and GB infant car seats. You need to purchase special adapters for them anyway (for example here). 1. Thanks to many seating options this can be the only stroller you will ever need. You can use it from day one till toddlerhood. 2. 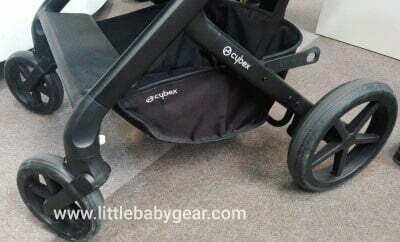 You don’t have to spend a fortune to have a trendy Cybex stroller! Balios S is a combination of Cybex fashionable design and affordable price. 3. With reversible seat, flat recline and oversized canopy this convertible stroller is so convenient to use! This is all-in-one luxury stroller. It’s not only a convertible model that grows with the child, but it also expands and adapts to growing family. VISTA comes with a regular seat that is suitable from 3 months up to 50 lbs and a bassinet that can be used since birth. It also converts to a travel system with MESA infant car seat (without adapters) and few other models from popular brands (Chicco, Maxi-Cosi, Nuna and Cybex) with proper adapters. I love UPPAbaby VISTA as travel system and I wrote more about it in my ranking of the best travel systems for 2019. Therefore here I focus mainly on its features as a standard and convertible stroller. VISTA can serve you as a single stroller with reversible seat, but you can also use it as a double stroller. It has lots of different seating options. It’s a perfect solution for parent who have one child, but plan on having bigger family soon. There is even an option for third, older kid (older toddler or preschooler) who can ride on the PiggyBack board. There are plenty of seating combinations for two kids: you can attach two regular seats (front or rear facing), two bassinets, two infant car seats or you can mix the seats if you have a baby and a toddler. Although UPPAbaby VISTA is an expensive stroller, it can be your only stroller for one, two or even three kids. It’s also perfect choice for parents of twins and preschooler/older toddler or three kids of small age difference. Let’s take a quick look at other features. VISTA has four foam core rubber wheels which are great for many types of terrain and you don’t have to worry about punctures. There is front and rear wheel suspension that absorbs shocks, so your kids will have pleasant, comfortable ride, whether you’re going over bumpy sidewalk or gravel path. The regular seat has nice extendable canopy with pop out sun visor that protects baby from harmful sun rays. This canopy gives great shade and covers baby up to the waist. I like that the canopy slides up to give the child more room to grow. There are also few features for parents convenience: adjustable handlebar that telescopes in and out (giving tall parents more space behind the stroller so they don’t kick the back of it while walking), enormous basket with capacity of 30 lbs (easily fits large diaper bag and grocery bags), one-step fold and self-stand for easier storage and transport. I like that it comes with few accessories (at this price it has to! ): bumper bag, bug and rain shields for toddler seat and bassinet. As a single stroller UPPAbaby VISTA weighs 26.3 lbs which is not a small, but it’s not the most heavy convertible stroller either. It’s an expandable stroller so it has to be strong and robust. 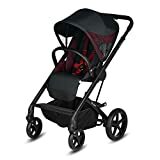 As for such an expensive stroller it very popular and has quite a lot of reviews at Amazon and most of them are positive. You can skip to customer reviews by clicking here. In the table below I present you the main advantages and disadvantages mentioned by other parents. If you would like to use it as a double stroller for toddlers, you will need to buy a RumbleSeat, which has smaller weight capacity than the regular toddler seat (35 lbs). Remember that VISTA, as other expandable stroller, gets more bulky and heavy when you add another seat. 1. Its quality, versatility and option of expanding is worth the money. 2. It’s a smart investment for YEARS and perfect option for parents who plan on having bigger family. It can serve you even for three kids at once. 3. It’s very easy and convenient to use for parent. It has probably the most capacious basket ever. UPPAbaby VISTA is one of the most expensive strollers on the market. Before you decide to buy it, make sure this stroller meets your needs and check available discounts for example at Amazon. If you would like to learn more about this stroller, here is my full review of UPPAbaby VISTA. This is a stroller for urban parents and it works great for everyday adventures in the city jungle. It’s lightweight, nimble and pocket-friendly. Regular seat is suitable for infant who can hold his head up and sit upright (which is around 6 months). The weight capacity is 50 lbs. It features multi-position recline so you will be able to find comfortable position for your baby whether he want to take a nap or observe surroundings. I only wish there was a lever for adjusting the seat back position, instead of a buckle and straps. The seat has vented top and retractable weather cover so you can use the extra ventilation on hot days and close it on more chilly days. 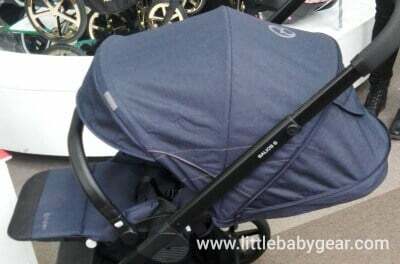 There is extendable 3-panel canopy which gives baby nice protection from sun rays. I like how far down it goes. There are two peek-a-boo windows (on two panels) so you could always keep an eye on your child, no matter if you use fully or half extended sunshade. There is one thing that I love about this canopy – you can slide it up and down to adjust it for your kid head height! When your baby gets taller you can raise the canopy to give him even more room to grow. It’s awesome feature and very rare thing especially among medium price range strollers. Thanks to this function City Mini is not only a stroller for toddler but also preschooler. The handlebar is not adjustable, which is not a problem if you are average in height (about 5’5″-5’11”), but it may be too low for very tall parents (above 6’3″). I like that the handlebar is rubberized, not covered with foam (which usually rips quickly). This standard stroller has 3-wheel construction. Dual front wheel is pivoting which makes the stroller very maneuverable and easy to turn. It’s super easy to steer in narrow or crowded places. You can also lock it for long-distance walk or more rough terrain. There is also front wheel suspension which is very useful when going over gravel or cracked sidewalks. Remember that those 8’’ wheels are not suitable for all types of terrain. 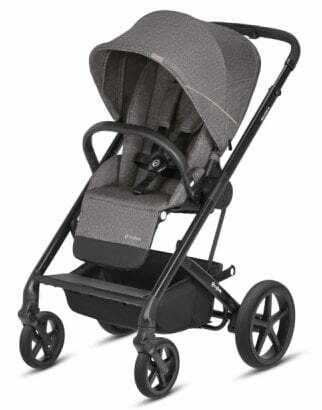 Baby Jogger City Mini is compatible with infant car seats from many popular brands. You can turn it into a travel system within few second, you just need a proper adapters (sold separately). You can also add a bassinet which provides fully flat position for newborn baby. Best option if you like long-distance walks. There is one more great thing about this convertible stroller – it’s super easy to fold with one hand, within few seconds. Pull the strap and it will close itself. 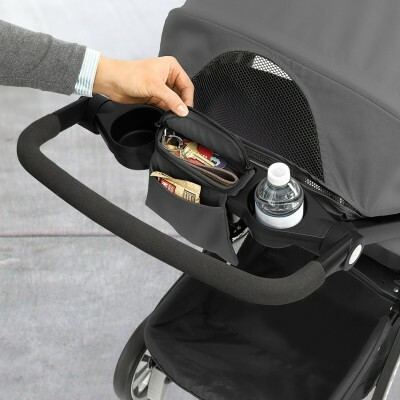 There is automatic lock that keeps the stroller folded. 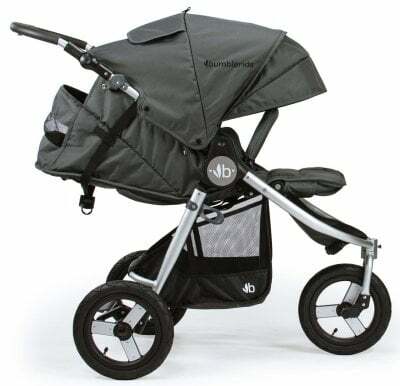 Baby Jogger City Mini is very slim when folded and doesn’t take up much space. Perfect solution for those who have small cars or not much free space at home. And since it weighs only 17.6 lbs it’s very convenient to carry up and down the stairs and easy to lift to the trunk. 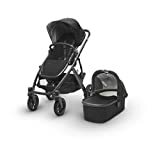 This stroller is extremely popular and highly rated by customers at Amazon (click here and check how many positive reviews it has). In the table below I put the most frequently mentioned assets and flaws. This stroller is not all-terrain and it’s definitely not suitable for jogging. It works the best for smooth, flat surfaces, but can handle cracked sidewalks and gravel as well. Also, pulling the strap to fold the stroller requires using some force. It takes some practice. 1. Great stroller for everyday use for city dwellers. Lightweight and compact enough to fit in tight and crowded places. 2. Thanks to flat fold it is a space-saver – wonderful solution for small cars and small apartments. 3. It’s made of good-quality materials and very convenient to use, yet it’s not overly expensive. 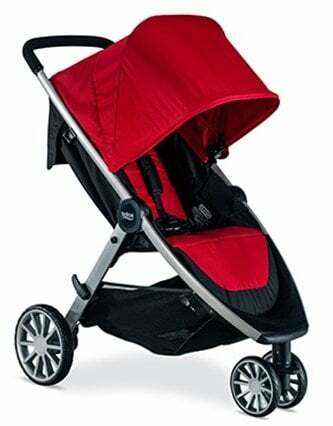 This is highly-rated and recommended by dozens of customers convertible stroller in a medium price range. Ergobaby 180 Reversible Stroller is very convenient for everyday use – it weighs only 20 lbs! You can easily lift it to the car trunk or even carry up and down the stairs. Thanks to such a lightweight construction and carry handle it’s very portable. Main seat features near-flat recline – you just need to squeeze a buckle with straps and set the back rest at any position you want. If you add the Ergobaby Comfort Cushion the seat will be suitable even for smaller infants. What I love about this seat is that it’s perfect for hot weather – the top is fully vented. You’d be surprised how big the mesh panels are! There is also awesome HUGE canopy that provides full shade from sun rays. No more worries about annoying sun in baby’s eyes. Moreover, Ergobaby stroller can be used from day one if you convert it to a travel system with one of compatible infant car seats from brands like Cybex, Nuna, Britax, Chicco and Graco. What’s unique about this stroller is that is comes with reversible handlebar. So when you want to change your baby’s position from facing out to facing you, there’s no need to remove and lift the seat. You just need to flip the handlebar to the other side. I am a mom too and I love how simple, quick and convenient it it! Moreover, Ergobaby stroller has 4 lockable wheel – each with independent lock and brake. There is even option of 4-wheel steering, where all four wheels are swiveling a full 360 degree just like a suitcase. You can read more about steering option in my full review of Ergobaby 180 Reversible. Notice, that the wheels are made of EVA foam and there is no suspension, therefore this convertible stroller is not suitable for rough surfaces or off-road strolling. They are designed mainly for flat terrain like concrete and asphalt. This stroller features easiest folding mechanism ever! Great thing about this stroller is that you can fold it with one hand, while holding your child in the other arm. Just pull the handle in the middle of the seat and it will collapse down. It also features fairly compact fold (dimensions: 30″ x 23.5″ x 14″) which makes it easy to store at home and it doesn’t take up the whole trunk. There are few useful accessories for Ergobaby stroller which you can find on brand’s official website (for example: Comfort Cushion, Weather Shield and Child Snack Tray). Ergobaby 180 Reversible is of the convertible strollers that recently have become very popular. It has over 200 reviews on Ergobaby site and dozens of positive opinions at Amazon. What features parent praise and complain about most often? 1. 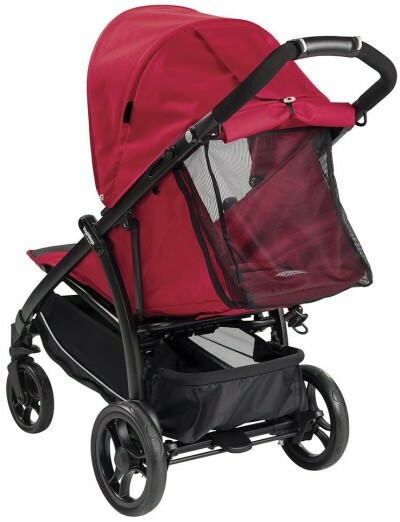 This stroller is good choice for walks in the city, shopping, going to the zoo or parks. 2. Thanks to large canopy and huge mesh seat top Ergobaby 180 Reversible works great for summer strolls. 3. 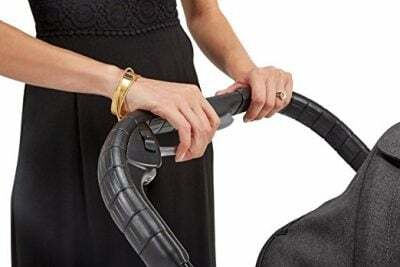 Reversible handlebar makes mom’s life much easier! 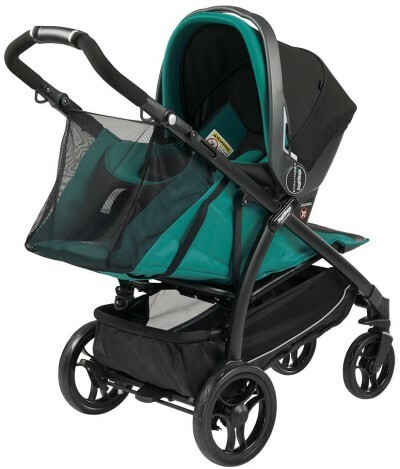 Britax B-Lively looks almost exactly like famous B-Agile stroller. I believe this improved model will quickly become a best-seller just like its ancestor. It’s simply a good budget option for urban parents. The Britax B-Lively stroller is designed for use from birth to 55 pounds. This means that it offers you years of usage and might actually be the only stroller that you’ll ever buy till your kid hits around 3-4 years. You need to take good care of it, of course! 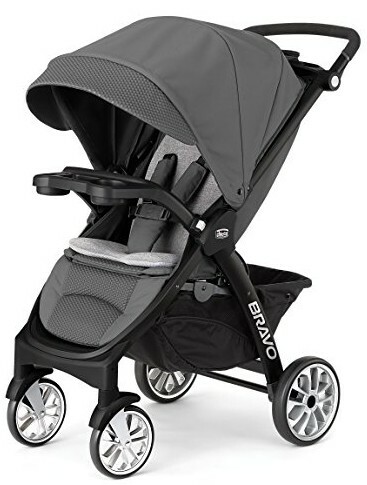 There are 2 features that make the B-Lively one the best convertible strollers in 2019: its weight and one-hand quick fold design. 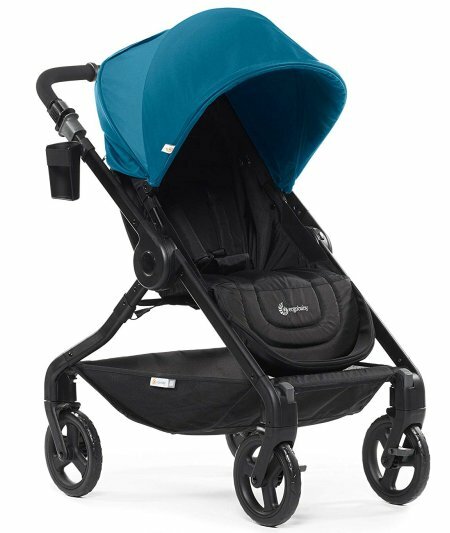 The B-Lively is definitely one of the lightest convertible strollers that I have come across at 20 pounds. This lightweight design is a really big deal for a stroller that is meant to travel with you wherever your kid goes. Its one-hand fold design, on the other hand, coupled with the low weight means that you can fold and load it in and out of almost any car’s trunk without lots of struggles. On this note, folded B-Lively measures 29″(L) x 23″(W) x 12″(H) when folded. As such, it can fit in most average – size car trunks with ease and still leave you with tons of room for your trips’ car supplies. What I love most about this seat is its infinite recline options that allow you to recline the seat really deeply. It’s not a fully flat recline (and less deeper than Bumbleride Indie offers), but it’s perfect for naps on the go. According to the manufacturer the lowest position is newborn-ready, but I would recommend waiting at least 3 months as the baby gains neck control. As far as the regular seat is concerned, it has a width of 11 inches and has a good amount of padding to keep the young rider cozy throughout the ride. It also has a 5-point system which although a common household feature among most strollers nowadays guarantees a superb level of safety. Another impressive feature of this stroller is its Click and Go system which makes it compatible with all Britax infant car seats. 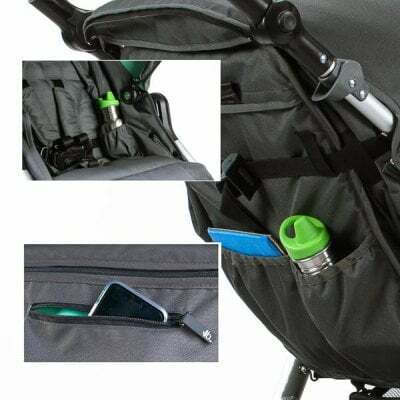 Basically, the B-Lively stroller frame has receivers where you insert your Britax infant car seat’s connectors. The essence of this is to avoid waking up the baby as you transfer them from the car to the stroller. 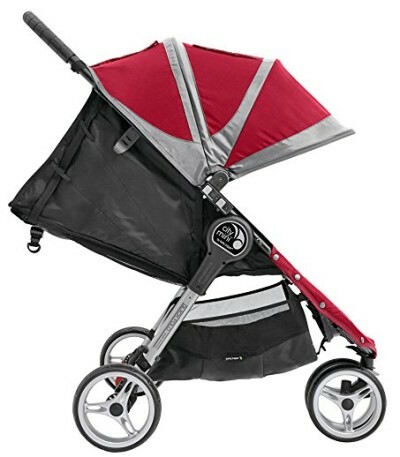 The Britax B-Lively also has a really large canopy to protect the passenger from the elements. True to this manufacturer’s tradition, the canopy is rated at UV 50+ meaning that it blocks up to 98% of the UV rays from the sun. This canopy is breathable thanks to zippered mesh panel. So, there’s no risk of your babe baking in it during hot summer strolls. And there’s also a peek-a-boo window that allows you a quick glance at the child without having to stop. As for a convertible stroller, B-Lively has only a decent storage basket. It can accommodate big diaper bag, but it’s quite shallow, so you can’t fit there a lot of things. On a positive note, there is additional zipper pocket for your personal items like a phone or snacks. How easy is it to push this stroller? Let’s talk about that. 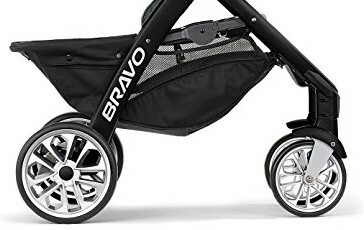 Designed to be one of the best convertible strollers, the B-Lively has a 3-wheel configuration that I really find convenient to push, especially when compared to many strollers with a 4-wheelset. This 3-wheel system coupled with the lightweight design also makes it possible to push this stroller using one hand which is very practical – as we all know mom’s usually don’t have two hands free! However, you should remember that one-hand steering is possible rather only on flat, smooth terrain. This stroller is not meant to be all-terrain, it’s designed for city use only. Keep in mind that its wheels are non-inflatable. That being said, it’s important that you don’t take it on very rough surfaces. An important addition here, however, is an all-wheel suspension system that absorbs some of the shocks, but the more uneven the terrain, the more bumpy the ride. Here are some of the pros and cons that the previous buyers mentioned a lot. If you’d prefer to check the customer reviews on your own you can do it here. This stroller does not have an adjustable handle. It might be a letdown if the stroller is to be pushed by individuals with varying height needs. In addition, currently this convertible stroller is not compatible with other car seat brands as there are no adapters for them. The brands plans to release adapters in the future. 1. Lifting it to the car trunk or carrying down the stairs is not difficult, because it is one of the lightest convertible strollers. 2. One-hand fold design is very useful as it allow you to easily close the stroller when holding baby in other arm. 3. There’s no need to spend extra money if you want to convert it into a travel system with one of Britax car seats, as the receiver as built-in. This is a high-quality stroller that easily converts into a travel system and infant car seat carrier without any adapters. Moreover, it’s a low-budget option, yet it comes with few handy accessories. It is equipped with a regular seat, suitable for infant who has developed neck and head control. The seat features multi-position recline so the baby could comfortably nap during the strolls. The seat is softly padded and there is additional removable and reversible insert. It helps to create super comfy and cozy place for the baby and gives better support for smaller infants. There is one more great feature – the seat unit is removable so you can convert this stroller into an infant car seat carrier for KeyFit. In this mode you stroll just with the frame and attached car seat. Thanks to this option the stroller doesn’t get much bulkier or heavier. You can also use it as a travel system and attach the infant car seat when the regular seat is still on. It’s convenient that you don’t have to remove the seat and store it, but in this mode the stroller is heavier. And you don’t need any adapters for KeyFit infant car seat. It easily attaches to the stroller thanks to the child tray. 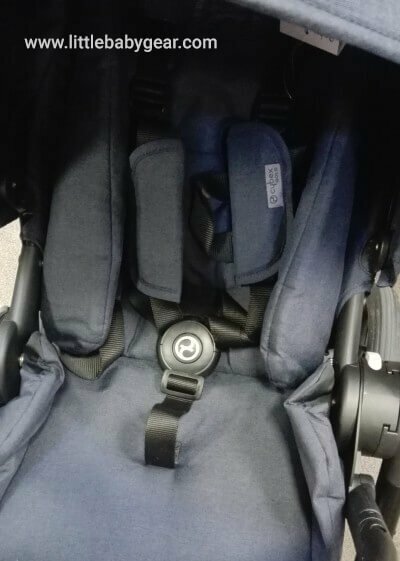 Back to the regular seat – it has extendable 3-panel canopy with additional sun visor which provide decent shade for the baby. There is also mesh peek-a-boo window so you can check on your little one at any time. Chicco Bravo LE rear wheels are 9’’ and the front swivel ones are 7’’. They are made of hard plastic so they are not all-terrain. However, there is all-wheel suspension which helps a little bit when you stroll over gravel or cracked pavement. I like that this convertible stroller features one-hand fold and self-stand. You just pull the handle, hidden in the bottom of the seat and the stroller breaks down in half. It doesn’t take up much space when folded, but the fold isn’t as flat as City Mini or Graco Verb. It weighs 23 lbs which is not a little, but it’s not excessively heavy either. Included accessories are another advantages. Chicco Bravo LE comes with convenient parent tray which has 2 small beverage holders and zippered pouch. There is also a child tray with a place for baby’s snacks or toy and two beverages. Under the seat there is a fairly big basket which can accommodate medium-sized diaper bag. It is easily accessible from the back. There is one more feature that I find very handy – adjustable push bar. Great feature for very short and tall parents (like me and my husband) and not very common at this price. This standard stroller gets more and more popular recently. No wonder, it’s really well equipped, made of quality materials and has pocket-friendly price. It has over 70 reviews – at least at the moment I’m writing this ranking (you can check the current number of customers reviews here). Many parents recommend it as easy and convenient to use. 1. According to many customers this stroller is worth every penny. For a reasonable price you get high-quality and durable product. 2. It is really easy to fold with one hand which is essential, because parents usually don’t have two free hands. 3. It has few accessories included so parents don’t have to spend extra money on these items: parent tray with cup holders, child tray and soft seat pad insert. 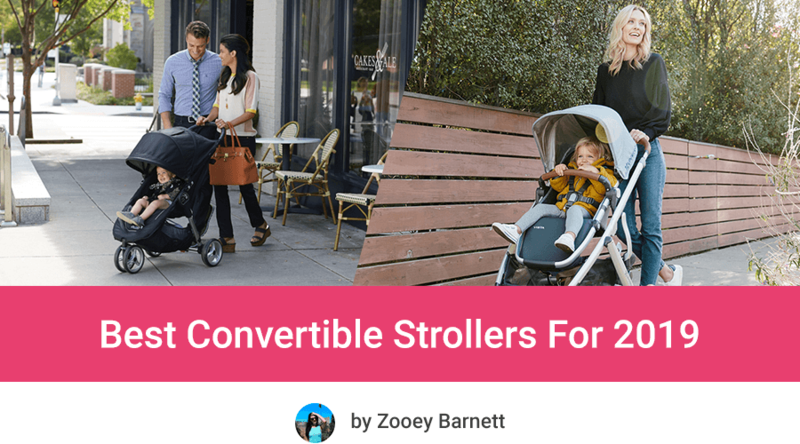 This is one of the most stylish convertible strollers for 2019. This medium price range model comes with many useful features. It has lightweight frame made of lacquered aluminum, which is sturdy and stable at the same time. Booklet weighs only 19.6 lbs which is really nice as for a full-sized stroller. You won’t have any problems with carrying it down the stairs or lifting to the car trunk. Moreover it has nice slim design which makes maneuvering through tight spaces, shopping aisles or crowded sidewalks much more easy. It has pivoting front wheels which gives the stroller better agility and makes it easy to turn on a dime. The wheels can be also locked which adds the stability. All wheels have ball bearings and suspension – thanks to that the stroller is easy to push and glides smoothly. You can even take in on a slightly rough terrain. However wheels are made of hard rubber (non-inflatable) and they are not very big, so this stroller is not all-terrain. There is one-step parking brake that locks the rear wheels. Now let’s take a look at the seat. It features multi-position recline and you can easily adjust the back rest with one hand using a buckle with straps. The seat goes really low, but it’s not truly flat position. There is also vented top, very useful for summer days. You can close it with a cover on colder days. Although manufacturer says the reclined seat is suitable for newborns, I would recommend using the regular seat for infant who can sit unassisted and has neck control. If you want to use this stroller for younger baby you will need an infant insert (support pillow for head and body) for the regular seat. Without this insert smaller baby won’t be properly secured in the seat. There’s one more option. You can convert Peg Perego Booklet into a travel system with Primo Viaggio 4/35 or Primo Viaggio 4/35 Nido infant car seats. And you don’t need to spend money on adapters, because the car seat attaches directly to the retractable anchors. 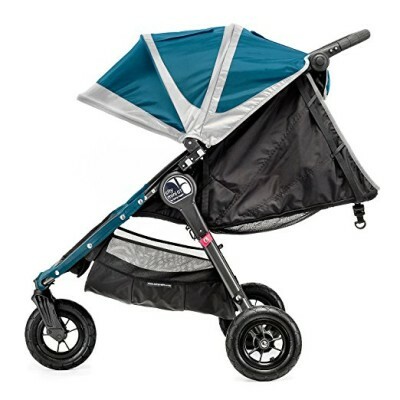 This convertible stroller has 2-panel canopy with pop out sun visor with UV protection (UPF 50+). The sunshade doesn’t cover baby’s knees but protects his head. There is also a peek-a-boo window so parents can always keep an eye on their little one. There are few thing that I really like about this stroller. It has adjustable handlebar with wide range of height settings, so it’s really comfortable for all-height parents. Moreover if you are looking for a stroller with big basket, Peg Perego Booklet won’t let you down. The storage bin under the seat is very spacious and offers easy access from the back. You will be able to fit there large diaper bag and few other essentials. Peg Perego Booklet folds up easily and quickly. It closes inwards so you don’t have to worry that the seat fabric gets dirty during transportation or storing. It stands on its own and has automatic lock to simplify storage. A large majority of customer reviews of this stroller are positive. Below you can see the main features that parents mention as advantages and disadvantage. You can also check the customer reviews on your own. 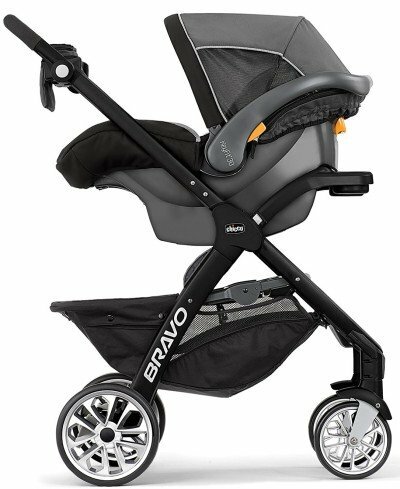 This stroller can be converted to a travel with two infant car seats: Primo Viaggio 4/35 or Primo Viaggio 4/35 Nido. It is not compatible with other car seats. 1. As for an everyday stroller it’s very light. 2. It has plenty features for parents convenience: adjustable handlebar, big and easy to access storage basket, easy to use foot-brake. 3. This standard stroller can be your only stroller, if you add the infant car seat. All standard modern strollers are convertible. They have many add-ons, adapters, you can switch seats and reverse them. You can converted them into a travel system by adding an infant car seat. Some models works only with car seats from the same brand, while other can be used with different car seats if you add proper adapter. 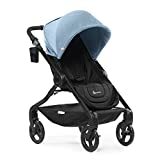 Some of the convertible strollers can be even bought with a matching infant car seat, for example UPPAbaby VISTA + MESA or Britax B-Agile + B-Safe 35, that’s why some of the models I included in this ranking, you can also find in my ranking of the best travel systems. A big advantage of modern standard strollers is that the toddler seat can be replaced with a bassinet. And therefore you can convert this stroller into a pram. Thanks to the function of travel system and compatibility with bassinet, you can have all-in-one “infant-to-toddler” stroller without spending a fortune! Some of the modern strollers are also expandable – you can use them as single or double, or even make a room for the third child. You just add another car seat, bassinet, toddler seat or a standing board and voilà! Expandable strollers are great solution for parents who have one child, but plan on having another child soon. It’s great because you can use one stroller since birth till toddlerhood or even one stroller for two or three kids. It means that you can not only save space in your house, but also save money! Nowadays convertible is a new standard. Modern “standard stroller” doesn’t mean bulky and heavy vehicle. Many models are very agile, have great suspension system and can handle even the tough terrain! 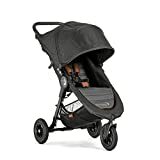 This is the best about this stroller – you can use it on different occasions: it’s easy to push through shopping alleys, bumpy sidewalks, grass and gravel park paths. Most standard pushchairs weigh from 16 to 37 lbs, which makes them heavier than umbrella strollers. But remember that this type is more functional than lightweight strollers. Standard type is not as bulky as joggers, but of course you can’t jog with this stroller, because of the safety conditions! Majority of standard convertible stroller has reclining seat, but it doesn’t recline fully (which is the only position for sleeping infant). If the stroller doesn’t offer flat position, it is not suitable for newborn. That’s why the regular seats in convertible strollers are better for toddlers, but many of them can use from birth with a car seat or bassinet. I started using the regular when my daughter was 8 months old, but I know parents who pushed their 5 month old babies in that seat. Everything depends on your baby’s pace of development. Some kids can sit upright very early, some need more time (and that’s nothing to worry about:)). Many modern standard strollers have reversible seat which means that your little passenger can face you or explore the surroundings during your trip. The seat should be nicely padded and have five-point harness so it could provide a comfy and safe ride. Standard strollers vary in size and weight, therefore they have also different wheels. Generally speaking bigger wheels with air-filled tires are the best for rough terrain, but rubberized tires and suspension also make the stroller suitable for many types of terrain. Standard stroller often have only a parking brakes, operated by foot, handbrake is a rare thing. Paring brakes can also vary, they can be single action which is easy to operate, or double action which requires using more advanced system. 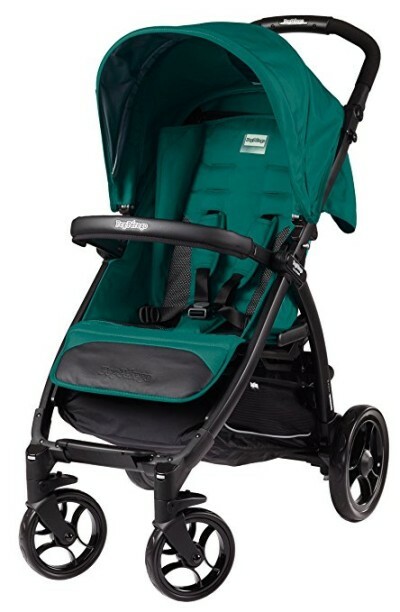 Some strollers, for example UPPAbaby VISTA, have also a color indicator, that informs if the brake is set properly. Some parents say this features is redundant, but in my opinion it is very useful especially if both parents vary in height. I am rather small and short person, but my hubby is much taller than me. When we were using a stroller with unadjustable handlebar strolling was inconvenient for both of us – for me the handlebar for too high, for him it was too short! Adjustable handlebar is a big advantage for us. 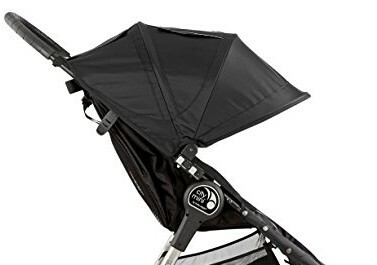 Considering you will be using a standard convertible stroller till toddlerhood, the canopy should be big enough to provide nice coverage even for taller baby and give him a room to grow. Sunshade should be extendable so you could adjust it to the weather conditions. Peek-a-boo window is a must-have in my opinion. I love windows made of mesh, because they provides extra air-flow. When you go out for a stroll with your baby, you need a lot of things: diapers, wipes, blanket or a jacket, some snacks and drinks, toys… Not to mention a bag with your essentials like wallet, cell, keys etc. 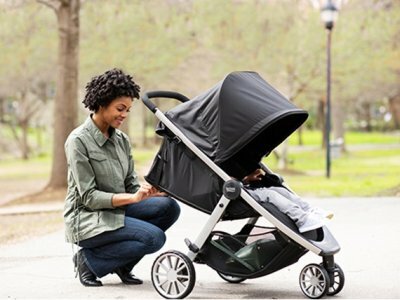 Therefore stroller should be equipped with a large basket underneath the seat so it could accommodate all of these essential things and even more! 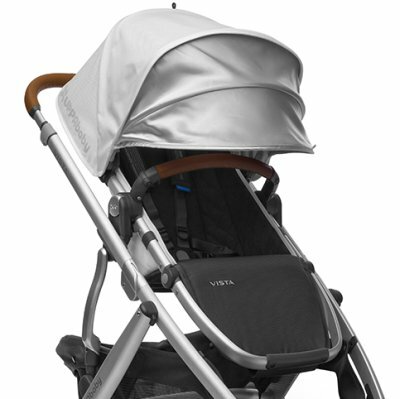 Great example of a stroller with a big basket is UPPAbaby VISTA and Chicco Bravo LE.